2 Days of Wet Wild Fun! Friday – You will arrive to a refreshing Welcome Party at the base camp to enjoy wonderful cheeses, Refreshments and small plate Hors d’oeuvres before settling in for the night. Saturday -The Kennebec River Gorge is one of the most beautiful in the East with steep rock walls on both sides, and with many waves that are four to six feet high. Paddle into rapids with names like Big Mama, White Washer, and the infamous Magic Falls. Then, with the rapids behind us, jump in and float with the current while you feel the power of the river, taking you downstream. 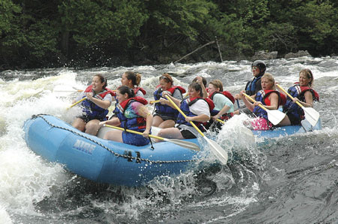 Take a look at just some of the fun you can have rafting the river. Sunday – We will enjoy another great breakfast and then a ½ day on the Kennebunk River. We will wrap it up at 1:00 pm. so you can drive home and have time to stop at a few other Maine attractions on your own. Saturday night lobster/clambake with all the fixin’s! LIMIT 18 PEOPLE! So sign up early! !